Well-designed cabinets help you keep your home or business clean, tidy, and organized — but they also make a big difference to the overall look and feel of a space. 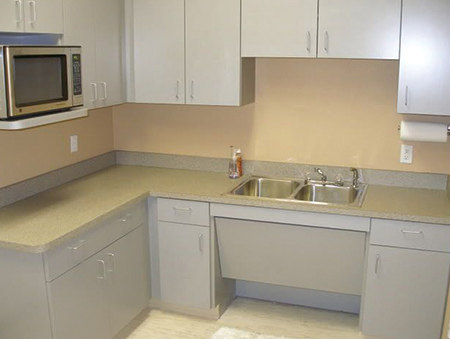 At Commercial Cabinets of Austin, we design, build and install beautiful, functional cabinets for property owners throughout the region. Great cabinetry starts with a great design. We offer a complete design-build service that's customized for each client. Give us a call today to book a cabinet design consultation. We'll come to your location, measure your space, and draw up a set of plans. If you prefer, we can also work from your architect's plans — it's up to you! Many cabinetmakers arrive at your location with a million puzzle pieces to put together. At Commercial Cabinets of Austin, we do things differently. Our team builds your cabinets at our shop, so we arrive at your home or business with a set of fully assembled cabinets that are ready for installation. This saves time and minimizes disruption to you, your family, your employees, and your customers. The installation process is quick and easy. We pay close attention to detail during the design and assembly process to ensure a flawless installation every time. Each cabinet is perfectly measured for your location, and our installers work hard to meet and exceed your expectations.